Hot Docs Ted Rogers Cinema - Safe Space Podcast Live! Safe Space is a smart and hilarious podcast that looks at the news and does a double take. Each week, it breaks down the big stories, studies the major issues and has fun in the most delightfully trivial way. After wowing audiences at last year's Hot Docs Podcast Festival, Safe Space closes its latest season with a special live show that will tackle the big questions, the dumb questions and everything in between. Is Donald Trump good for feminism? Does pie have any redeeming qualities? Should you stop talking to that one friend that always posts your worst pictures? Hosted by writer Vicky Mochama, this will be a night of topical conversation and spicy hot takes featuring Toronto's most compelling journalists, activists, comedians and more. Special guests: Anne T. Donahue (author and pop culture writer), Ishmael Daro (Digital Editor, Democracy Now! ), Jane Lytvynenko (BuzzFeed reporter) and more! 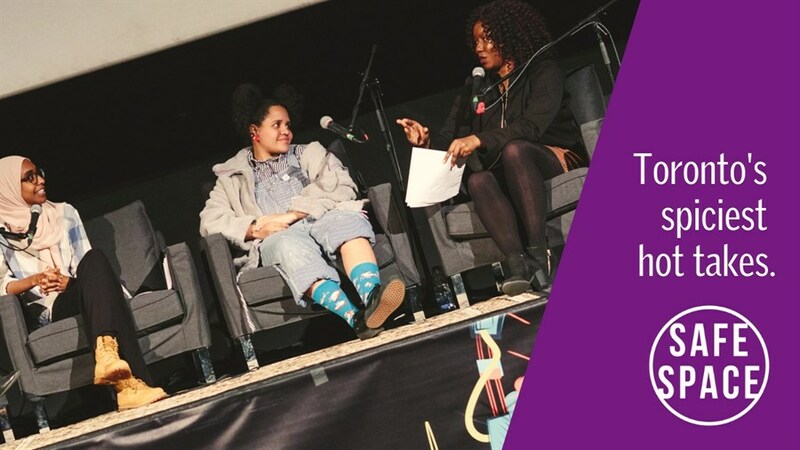 Hot Docs Podcast Festival Presents: Live performances of chart-topping audio shows take to our stage year-round in the lead up to the annual Hot Docs Podcast Festival.